SATRA’s Head of Research, Tom Bayes, describes how SATRA research into the grip provided by protective gloves has led to a suite of effective test methods. The European Union (EU) has what is probably the most comprehensive legislative framework for protective clothing anywhere in the world. All protective gloves that are supplied into the European market are legally required to bear a CE mark to show that they comply with either the Personal Protective Equipment (PPE) Directive 89/686/EEC or the Mechanical Devices Directive 93/42/EEC. Depending on exactly what protection is claimed, the gloves may be tested against one or more of many EN test methods. Because of the multitude of protective requirements for gloves in different occupations, there are many EN methods specifically applying to gloves. Other areas of the world have requirements for confirming the performance of protective gloves, and these are detailed in national or international test methods. A very important safety related property covered in only one very specific standard (EN 381 for chainsaw gloves) is that of grip. Perhaps the primary contributing factor to grip is surface friction (which is not itself covered in any testing standards), but glove fit, extensibility and flexibility will all have a significant influence. The most closely related property to grip which is currently routinely assessed for all protective gloves sold within Europe is that of dexterity, specified in EN 420. This standard assesses the wearer’s ability to pick up small cylindrical metal pins of various sizes from a flat surface, using only the thumb and index finger. Performance here is critically dependent upon fit - if there is any excess glove material at the end of the finger or thumb, this task will be harder to achieve. Glove grip can be of critical importance in many applications - from lifting heavy objects to supporting the wearer. However, there are also various ways that objects can be grasped, using only parts of the fingers up to a whole hand clasp. Although a simple surface friction test could address this shortcoming in glove testing regimes, it would fill in only part of the grip picture. This is because wearers do not apply only one level of gripping force - continuous feedback means that wearers will increase the grip force until a satisfactory level of control is obtained to achieve the task. If subsequent slippage is detected, the wearer will then automatically increase grip to try to compensate. The grip performance of the glove under different conditions will affect the ease or difficulty of the task, and could potentially lead to fatigue, accidents and injury. Any form of grip assessment must consider this. It is not simply a case of the best grip, but more that control and the ability to manipulate the object being gripped in order to complete the task in hand is assessed. Very importantly, if the user constantly has to modify their grip techniques due to lubricants or contaminants, this creates fatigue, both physical and mental, that can lead to increased accidents or inefficiencies in the operation. Accidents may be as simple as frequently dropping the product or making positional errors, or something more serious leading to personal injury. Additional factors that affect glove grip also need to be included. Lining materials have an influence on grip: if the glove provides protection against certain substances it is unlikely to breathe and moisture can build up. The friction properties of the lining against the skin in combination with fit can dramatically affect the grip properties as perceived by the wearer. Medical gloves as used by surgeons are frequently double donned; that is, the wearer actually puts two gloves on the same hand, one over the other in case of failure of the first layer. This brings a third factor into the grip equation - the friction properties between the inner of one glove and the outer of another, possibly with a contaminant such as talc. For the reasons described above, SATRA has developed a whole-glove grip testing protocol. This comprises two SATRA test methods: the first uses just the index finger and thumb and the second uses the whole hand (thumb, four fingers and palm). The first, SATRA TM437:2010 - Glove ergonomics: finger and thumb ‘pinch-grip’ - requires a subject wearing a glove to grip an instrumented, vertically-suspended flat metal bar and pull this downwards to lift a counterbalance loaded with specific test weights by a set distance. The grip is then relaxed until slippage of the bar against the glove surface is detected, when the wearer must increase the grip to catch the bar. The bar is then gently raised to its original, unloaded position. Similar in some respects to the previously mentioned EN 420 dexterity test, this pinch-grip test?differs in two crucial aspects: the pads of the fingers rather than the tips of the fingers/thumb are used, and the wearer is required to apply significant force to the bar. Throughout the test cycle, the grip forces are recorded by means of an electronic load cell within the bar. The wearer’s comments on the ease of action and the effectiveness of the grip (which will include a subjective opinion of the security between the glove lining and the wearer’s skin, as well as that between the glove outer and the test bar) are also recorded. The task, a strict sequence of actions combining grip, control and manipulation is carried out to a time base chosen to make the task slightly challenging such that if the glove does not perform, it may in fact be impossible to complete the task. The task is designed to represent a repetitive operation that one may find in the manufacturing industry and is completed ten times in succession by the subject. Thus, if the glove performance is not as required, the task becomes demanding, the time base is lost and the subject may actually start to experience fatigue. This is very noticeable on the force recordings as they start to fall out of synchronisation with each other. The principle behind this second test is similar to that specified in the EN 381 chainsaw glove test. In this EN 381 test, subjects are required to grip a narrow cylindrical bar as tightly as possible both with and without the chainsaw gloves. Any loss in grip force due to the gloves is determined and must not exceed a certain level. SATRA has also developed its own whole glove grip test, published as SATRA TM438:2010 - Glove ergonomics: whole hand grip. TM438 requires the test subject to firmly grip a cylinder and pull this downwards to lift a series of weights to a set distance. The grip is then held for a set time before returning the cylinder to the original, unloaded position. If any slippage occurs, the subjects are required, if possible, to maintain grip by applying a higher force. This test gives an excellent indication of how the grip surface across the whole glove performs under realistic working conditions. Again, the results generated are both objective (force data from the load cell within the grip cylinder) and subjective (user comments on glove performance). Both SATRA grip tests can be applied to a wide range of gloves, from fine textile or latex products to heavy-duty industrial gloves. Lighter-weight gloves, however, would be best tested using the pinch-grip test, as this replicates tasks where greater dexterity is required. Both tests are particularly suited to gloves produced in non-absorbent polymeric materials. This is because such gloves are essential where liquid contaminants may be present in the working environment, and these contaminants can have a significant adverse effect on the gloves’ grip performance. Indeed, both tests are designed to compare the grip performance of gloves before and after surface contaminants are applied. The standard liquids recommended are water and a common engine oil (15W/40 mineral oil). However, other contaminants can be chosen, relevant to the gloves’ intended end-use. These challenging comparative tests will help manufacturers to develop better gloves (and substantiate any claims made for them), as well as enable end-users to better select the correct glove for the job in hand. 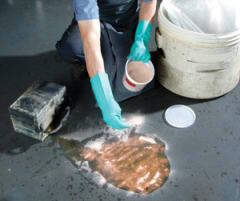 Experiencing poor grip when handling contaminated surfaces will not only have a bearing on how well the job is performed (with the dropping of objects and the loss of wearer stability being direct safety hazards), but it can also increase stress and fatigue on the joints of both the hand and individual fingers, which could lead indirectly to further hazardous situations. Fatigue will lead to poorer control and hence accidents. The choice of glove is crucial to ensure the wearer can intuitively complete the task. This is why the subjective comments need to be considered along with the actual loads recorded and it is not just as simple as the better the grip, the better the glove. If the wearer has to constantly adjust their grip force to account for differing amounts of contaminants this makes the task far harder and generates more fatigue. In a critical situation, the wearer will have to always exert the maximum force to ensure grip is maintained. The glove needs to have adequate performance, but also the difference in grip required between dry and contaminated should be a minimum if fatigue is to be avoided. Fatigue is one factor in avoiding upper limb disease. It is more commonly known within the gloves business as repetitive strain injury, or occupational overuse syndrome. These two commonly used terms can be misleading with regard to the many factors that can contribute to the onset of the conditions - hence the problem being referred to as ‘upper limb disease’. The signs would typically include aches, pains, tension and disorders involving parts of the arm, from fingers to the shoulders and/or the neck. There can also be problems with the soft tissues, muscles, tendons and ligaments, along with the circulatory and nerve supply to the limb. The symptoms are usually caused or made worse by work. They can include problems such as carpal tunnel syndrome, tenosynovitis, and also conditions where there is pain but not a recognised condition that can be identified. More concretely, when talking/interviewing your work force ask them if they have aches and pains, tenderness in muscles, stiffness, weakness, numbness, cramp and/or swelling. What causes upper limb disease? There are a number of factors, the most obvious being repetitive work that is carried out for a long period of time and uncomfortable working postures, both of which can be addressed by reviewing work flow organisation and looking at and adjusting the ergonomics where the activity is being carried out. Other things that should also be considered are the working environment itself - look at and modify the temperature, lighting, demands, work breaks or lack of them. The point is that gloves can only do a part of the job and this has to be part of a holistic approach. Gloves with the appropriate grip have a major impact on the amount of grip force exerted, so it’s important to get it right and do your research. Workers are also more likely to suffer an upper limb problem if exposed to more than one risk factor. So how can grip help? Gravity is what causes things to fall, so if you want to lift something you have to grab it and hold onto it so it doesn’t drop. The energy required to hold anything is closely related to the friction co-efficient. A larger friction co-efficient makes it easier to lift things and this saves energy, leaving more in reserve for getting the job done. For an average male the arm can deliver up to 60kg of grip force, which implies that it is only possible for an average male to lift a dry weight of 24kg, on the basis that 1kg requires 2.5 kg hand grip force. Should the item lifted have a thin film of oil, then nearly 40% additional effort is required and reduces the technical lifting limit to 15kg, some 9kg less than in a dry situation. The new wave of grip products offered by some companies can reduce the amount of force required - and help to prevent against injury. SATRA produced these test methods primarily through requests from glove manufacturers and retailers to enable them to both rate glove performance for particular industries and contaminants, as well as a method by which the performance of new developments can be determined. However, it is also vital that this message is conveyed to those industries that are involved in procuring PPE, specifically gloves in this case, that there are quality assured methods of determining performance characteristics that meet their procurement needs. Indeed, it is quite possible to use these methods to quantify the performance levels of current preferred gloves, those which, historically, have given good performance and are popular with the work force, ensuring that future procurements are fit for purpose. SATRA test methods are highly regarded and can be found in many procurement specifications including those of the military. SATRA is a world leader in testing and certifying protective gloves, and offers a unique research and development service to help clients develop new products or refine and improve existing ranges. SATRA test methods are internationally recognised and form the basis of many international standards, including military specifications. Anyone interested in the research, development and testing of protective gloves is invited to contact Tom Bayes (tomb@satra.co.uk) ? Useful links: www.satra.co.uk - SATRA’s homepage, providing information on the organisation’s impressive technical experience gained over 90-plus years of technical research and testing. www.satrappeguide.com - An essential guide to personal protective equipment (PPE), which provides background information on the tests that need to be carried out to meet specific international standards, and answers to many of the questions posed by a supplier entering the European marketplace. www.satra.co.uk/spotlight - A rich resource of technical articles for manufacturers, sourcing companies and retailers looking to bring products to market, covering European and international legislation, product testing to standards, due diligence and supply chain efficiency covering a wide range of industry sectors. David Staniforth has more than 15 years of experience in sales, business development, key account management and marketing at operational and strategic levels. He is currently Partner at Noneuchi Consulting SA and Partner at Radar XI Ltd.
David is active with the Charted Institute of Marketing (CIM) and is a fellow of the Asian Institute of Technology. He has lectured at Liverpool Business School, at CIM on overcoming global business challenges, and has spoken at numerous health and safety events. He has also written for many of the respected international health and safety publications.